NEW YORK (May 19, 2015) — Iraq and Afghanistan Veterans of America (IAVA), the leading post-9/11 veteran empowerment organization (VEO) with the most diverse and rapidly growing membership in America, will host and participate in a series of events Memorial Day weekend to honor our nation’s fallen. 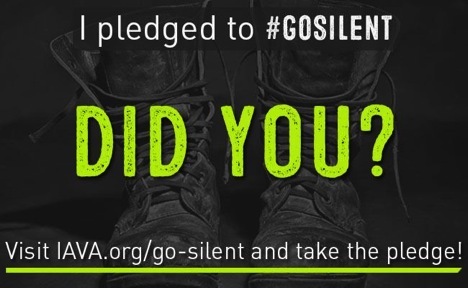 Leading up to Memorial Day, IAVA is promoting its fourth annual #GoSilent campaign, which encourages Americans to pledge a full minute of silence at 12:01 p.m. ET on Memorial Day. Visitors can access the pledge at iava.org/go-silent. The #GoSilent campaign allows for a shared, nationwide experience, in which pledges can be made in honor of a fallen veteran or service member. The moment of silence will coincide with events in New York, Washington, D.C., and across the country, including IAVA’s participation in a wreath laying before the Tomb of the Unknown Soldier at Arlington National Cemetery, a ceremony aboard the USS Intrepid in New York City, and local Memorial Day events nation-wide. In addition, on Saturday, May 23, in Washington, D.C., IAVA will host its first-ever InstaMeet – beginning on the steps of the Lincoln Memorial. The InstaMeet an Instagram-focused event that gathers people together to connect, explore and celebrate their creativity — will gather local veteran members and supporters before branching out to capture in photos the meaning of the holiday from the nation’s capital. The Instameet is open to the public and Instagrammers all over the country will be able to follow and contribute their own content using the #GoSilent hashtag. Also on the 23rd, in Charlotte, N.C., members will be in the pits to cheer on NASCAR driver Cale Conley as he races the No. 14 IAVA Toyota Camry in the Hisense 300 at Charlotte Motor Speedway. In tribute to our nation’s fallen, the car will be wrapped with a reminder of the #GoSilent campaign. Sunday, May 24, in Washington, D.C., IAVA members will ride in the annual Rolling Thunder event alongside Marine veteran, R. Lee Ermey on custom Victory Motorcycles. Over a million riders and spectators take part in this demonstration each year. On Memorial Day, Monday, May 25, IAVA staff and members will participate in wreath-laying events at Arlington National Cemetery in Washington, D.C. and at the Intrepid Sea, Air and Space Museum in New York City. Finally, IAVA’s own Nick Colgin and his comrades at Mission Memorial, who are attempting to summit North America’s highest peak, Mount McKinley, on Memorial Day, will carry two American flags covered with names of fallen service members, and also pause for the moment of silence. WHERE: Steps of the Lincoln Memorial, Washington, D.C.